The following story happened to me when I was a child. As I recall, I was sitting on a couch in the hall with a high temperature and abdominal pain—I had been poisoned. Pills didn’t help and I was very sick. I prayed the “Our Father” and other prayers, and then an icon of St. Panteleimon and his life caught my eye. My mother suggested I read a prayer to him, and so I did. I read it with zeal and heartfelt attention, such that I was even detached from everything happening around me. The heart of a child is pure, and therefore it was easy for me to fully “plunge” into the prayer. Although that sounds normal, after the prayer, read with attention and tears (I remember I even burst into tears), the pain passed IN ONE MOMENT. My fever came down and I immediately fell asleep. The next day, there were no traces of my malady. I’ve never seen anything like it anywhere. 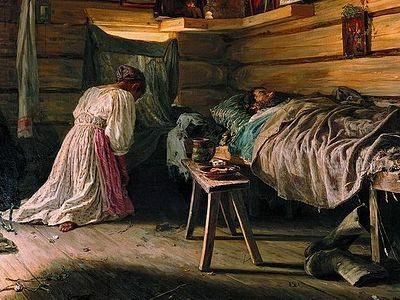 Now I always pray to St. Panteleimon when someone is sick and ask for his help for my family and friends. I advise all to pray to this wondrous saint more often. The Great Martyr and Healer Panteleimon has helped me more than once in my life. I’ll describe one example. I used to suffer from warts. They grew and multiplied. In such cases, the doctors advise burning them with liquid nitrogen, but I received no long-term effect from this. I tried to find treatment on my own, bought medicine at the pharmacy, and I tried folk medicine. But in vain. This all continued for several years. The time came when I turned to the healer St. Panteleimon and asked his help in healing. Literally a few days later a religious woman I knew advised me to buy some kind of wart remedy at the drugstore. Although it cost only pennies, it immediately helped. The warts disappeared and didn’t come back anymore. I was thus convinced that the saint heard my prayer and that my healing had come down from above. I had had no idea what could help: I saw how quickly they multiplied and that I had scars from getting them removed, and that after a while they would grow back again. I had no idea how to rid myself of them. Warts don’t bother me anymore. Glory to God. I would like to share an instance of miraculous help from St. Panteleimon. I was still living in Germany five years ago, in Cologne, and had just begun my Church life. I have a habit of reading the lives of the saints every day on Pravoslavie.ru. And then, five years ago, I read about the holy Great Martyr Panteleimon. That was Saturday evening. On Sunday, after Liturgy, some parishioners of our church invited me to a Catholic church where they have a particle of his relics. Before that I had no clue there was such a holy relic in the city I was living in. It turns out they let Russian priests serve a moleben to the holy Great Martyr once a year on August 9. They bring out the small chest with the holy relics and allow everyone to venerate them. I have often visited the saint’s relics since then and honor his memory. The following happened to me about four years ago: My tooth really started to hurt. The dentist said there was a pin in the tooth and that pus had formed underneath it. The pin was removed, the pus was cleaned, the dentist put the medicine in the hole, and he sealed the tooth. I was supposed to go again in two or three days. The dentist warned me beforehand: If you get sick, you’ll have to endure—that’s the way it goes. The next day, I had a fever and my cheek began to swell. The dentist told me on the phone that if my cheek was swollen it means pus had gathered somewhere, and that I had to come the next day to cut my cheek open and release the pus. And in such cases it’s not allowed to give anesthesia, or it would get even worse. My husband and I started reading the akathist to St. Panteleimon. By the third or fourth kontakion, I felt how liquid was running into my mouth and the swelling was going down. 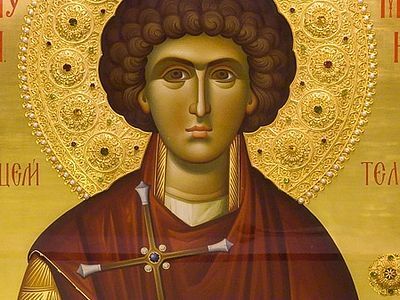 The Lord heard us by our prayers to St. Panteleimon! The night passed quietly. My husband and I went to the hospital the next day. The dentist was in shock: The pus had begun to come out by itself and in the most unexpected place, and it only needed to be drained. Everything had passed in just two days. O holy Great Martyr Panteleimon, pray to God for us! St. Panteleimon really helped me. Since I had just been baptized not long before, I didn’t know about many saints yet. One day we were getting ready to go visit our relatives in the village, and my nephew offered to take us. The road was long, and we, of course, were very tired, especially him. When we arrived at our destination, it turns out he had a fever—almost 104. My husband and I left for the city in the morning, and I stopped into the nearest church. The first thing I saw was a large icon of St. Panteleimon in the middle. I asked who it was, and having lit a candle to him, I knelt and prayed for my nephew’s health. I called him closer to evening and he was already almost recovered! Thanks to St. Panteleimon whose help saved my beloved nephew. I would really like to share my story, not even about help, but about salvation and, in fact, my way to the Church. It was 2006. I was on vacation at the Lazarevskoe Restort in Sochi in the summer. My trip was in the off-season and I was bored. Here I should say that I hade an old knee injury that really bothered me from time to time, and there was no way to fix it. So I was vacationing on the shore, and along the way they were selling tickets for various guided tours. The vendor was advising everyone to go to Abkhazia to the New Athos Monastery, to the wonderworking icon of the healer St. Panteleimon, saying people travel there from around the world to ask for health. I didn’t really pay attention, but I really wanted to go to Abkhazia: beautiful mountains, the gentle sea… I wasn’t thinking about a holy place at all. When would I have such an opportunity again? Of course, I can’t go skating, but thanks to the intercession of the healer St. Panteleimon, I didn’t become disabled! O healer St. Panteleimon, pray to God for us sinners! Save us all, O Lord! 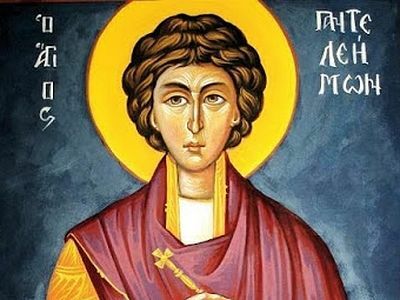 The day of the Great Martyr Panteleimon is celebrated, I think, by everyone who at least knows his name. Some celebrate it to a lesser degree—maybe just warmly smiling hearing today’s date, and some to a greater degree—going to Liturgy and taking Holy Communion. I wasn’t at Liturgy on his day, but I will definitely read an akathist to the saint. I have no direct proof of healing by the prayers of St. Panteleimon, because at that time, when my only son was sick with a terrible disease, I prayed to everyone I could whom anyone had told me about… And at that point, in 2002, I wasn’t baptized. But who do we have to look to for protection when medicine gives practically no chance of recovery? Some people ask God, and some all the “gods.” And I turned everywhere and to everyone, stopping into every church and temple with an open door. You can imagine my feelings—wings of hope on my back. As someone ignorant in regard to religion, I went up to the wonderworking Joy of All Who Sorrow Icon and lit a candle to the Lord, but from that minute and for a long time thereafter the gladiolus flower was a symbol and a promise for me that my son would recover. And that’s what happened. I don’t know how and what helped his healing, but, it was not without the intercessions of St. Panteleimon that he recovered. Although we weren’t baptized then, I still prayed to many saints. A long time passed and I became a Christian—that is, I received the Sacrament of Baptism, and now I’m a real Christian, and life probably isn’t enough for my gratitude to St. Panteleimon who immediately answered me, unbaptized and full of sins! I went to church often after my son recovered, but as for lighting a candle in front of the icon and venerating it—I often forgot! “I mean, everyone is healthy,” I reasoned. Until recently I continued to rush past his icon, throwing it a glance in passing and slightly nodding. Nonetheless, the reproaches of my conscience made me wonder one day how healthy people pray to him. And it was a great revelation for me when I read in the wonderful prayer of His Grace Jeremiah the Hermit to him how and what to pray to him about both day and night. My physical ailments and my son in his present health seemed like mere scratches compared with the cankers of my sinful soul then. The Great Martyr and Healer Panteleimon really helped me when I prayed to him for health! I had a very bad toothache once. I went to the dentist and he told me the issue was with my wisdom tooth which had grown in incorrectly, and it had to be removed. And it turned out it’s quite a difficult and traumatic procedure. I was terribly frightened and started reading the prayer to St. Panteleimon. The tooth stopped hurting literally a few days later and they didn’t have to take it out! I am very grateful to the saint for his help. 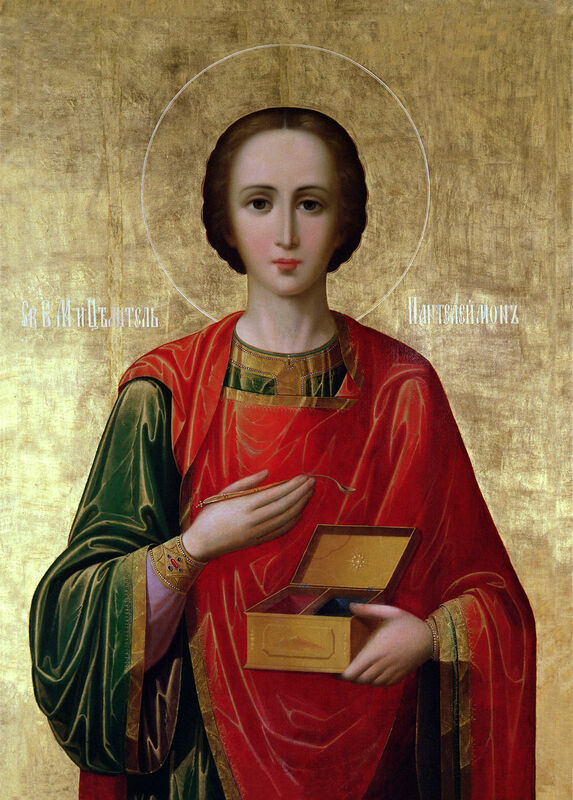 Glory to the Great Martyr and Healer St. Panteleimon! Glory to God for all things! Our whole family would read this prayer for my son’s healing about twelve years ago when the doctors found that he had an inexplicable disease. As a mother’s prayer is especially strong, I would pray several times a day, reading this prayer three times. My son was healed as if he’d woken up from a sickness! I always thank St. Panteleimon for his help! Sirach says: "Honor a physician with the honor due unto him for the uses which you may have of him, for the Lord has created him. For of the Most High comes healing, and he shall receive the honor of the king. The skill of the physician shall lift up his head, and in the sight of great men he shall be in admiration. The Lord has created medicines out of the earth; and he that is wise will not abhor them" (38:1-4).